The stage is all set for the election of the 14th President of India on Monday in a contest in which National Democratic Alliance (NDA) candidate Ram Nath Kovind has a clear edge in the electoral college over the opposition nominee Meira Kumar. The total value of votes of the electoral college is 10,98,903, and the NDA candidate is slated to cross the halfway-mark and get about 63 percent votes. Kovind, who belongs to the Bharatiya Janata Party (BJP), has the backing of all the party's allies besides several regional parties, while Kumar has been fielded by the Congress and some major opposition parties in what they call an "ideological battle" against the ruling party. 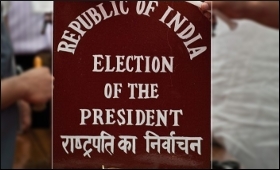 All arrangements have been completed for the presidential election, and polling will take place in Parliament House and respective state assemblies between 10 a.m. and 5 p.m. Elected members of both houses of Parliament and assemblies in states, including the National Capital Region of Delhi and the Union Territory of Puducherry, are eligible to vote. Counting of votes in the election will be taken up on July 20 and the result will be known the same evening -- four days before the end of the term of President Pranab Mukherjee. The new President is set to take over on July 25. Officials said that polling in Parliament House will take place in Room Number 62 and MPs will vote according to tables allocated to states they represent. Prime Minister Narendra Modi, Congress President Sonia Gandhi and party Vice-President Rahul Gandhi would vote on table number 6 as they are all MPs from Uttar Pradesh, the officials said. They added that there will be six tables. MLAs, who have chosen to vote in Delhi, would do so from table number one. In the electoral arithmetic, Kovind, a former Bihar Governor, has a distinct advantage over his rival, a former Lok Sabha Speaker, with parties like Janata Dal-United (JD-U) and Biju Janata Dal (BJD), who are not allied with BJP, deciding to vote for him. The Janata Dal-United has about 1.91 percent of electoral college votes, while the BJD of Odisha has 2.99 percent. In addition, the ruling TRS in Telangana (two percent), different factions of AIADMK (5.39 percent), YSR Congress (1.53 percent) have also announced their backing for Kovind. The announcement of Kovind's candidature created some fissures in the opposition with the JD-U announcing its support for him against the stand of its Bihar allies -- Rashtriya Janata Dal and Congress. Though the Aam Aadmi Party has declared its support to Kumar, its leader H.S. Phoolka, who has handled several 1984 anti-Sikh riots cases, has said he would abstain as he cannot vote with the Congress. The electoral college for the election comprises elected members of the two houses of Parliament as also of legislative assemblies. Election will be by secret ballot and in accordance with the system of proportional representation by means of single transferable vote. There are no whips issued in the presidential election. Kumar has appealed to members of the electoral college to "heed the inner voice of conscience" while casting their vote. Lok Sabha Secretary General Anoop Mishra is the Returning Officer for the election. The value of vote of an MP is 708 while that of an MLA varies from state to state depending on the size of its population. Officials said that each polling station has been given a specified number of ballot papers. While MPs will be given green ballot paper, MLAs will be given one that is pink. The electors have to mark the ballot only with a particular pen given to them at the polling station along with the ballot paper. In the last presidential election in 2012, Pranab Mukherjee had defeated P.A. Sangma and got over 69 percent votes. Officials said that ballot papers have reached the polling stations and requests made by the members of the electoral college about their choice of exercising ballot had been taken into consideration. The MPs have also been informed of their serial number in the electoral college. The officials said that after end of voting, ballot boxes will start arriving in Parliament House from Monday evening and will be kept in a strong room. The Assistant Returning Officers will also furnish an account of the total votes cast in their states. They said that the seal of ballot boxes will be opened on Aug 20 in the presence of representatives of the two candidates and the observers of the poll panel. The winning candidate will be given a certificate by the Returning Officer. Officials said that special security arrangements have been made to see that the ballot papers reach Parliament directly from the airport.